The Molten Tigrex is a new subspecies of the famous Tigrex that has the ability to explode. Read on to hear more! 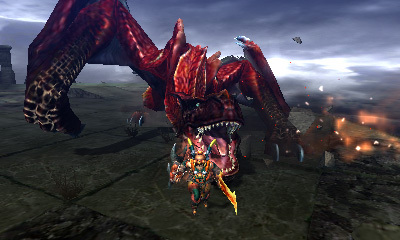 The Molten Tigrex, which I also like to call the Red Tigrex, is a subspecies which first appeared in Monster Hunter 4 and will be making its Western debut in Monster Hunter 4 Ultimate. As my nickname suggests, this beast is coloured a deep red, with blue spines running along its back and blue claws tipping its limbs. It’s a flying wyvern weak to water that’s capable of inflicting blastblight, which will explode when left on the hunter for too long. The Molten Tigrex is only encountered at the Tower Top, and as such has nothing to eat; it can only stop being low on stamina by getting mad, which is does frequently. It has two levels of rage. The first will see glowing red veins appear on its head, forelegs and tail. The second will see the veins light up along its entire body. With each level comes an increase in power and speed. The Molten Tigrex, like the other two species, has a powerful roar that has a short range but does damage if you happen to be too close when it goes off. Like the Brute Tigrex, it has a super roar in addition to its regular one that has a much larger range; it mostly affects the area in front of it and does a huge amount of damage. The Molten Tigrex is slower than its relatives, but is also noticeably bigger; the first time I fought it I thought it must have been at least a silver crown, but it was just a normal-sized specimen. It can jump across the map to reach you, but it doesn’t do this often; it is quite fond of hurling rocks, which you can see coming when it starts to draw one of its forelegs back. Like the other Tigrexes, the Crimson variety can charge across the map to meet the hunter and change its direction as it does so. It can charge up to five times in a row, and will always fall over at the end of the fifth charge, if it decides to go that far. Trying to change its charge direction when it’s tired will always result in it falling, which is an excellent time to attack it. When you’re up close, the Molten Tigrex can either spin on the spot or snap its jaws, even stepping forward as it snaps for extra damage. It generally releases blastblight-inducing clouds when it uses either of these attacks, as well as when it charges; these will float across the ground for a few seconds before disappearing in the air. Touching one will cause it to disappear, and inflict you with blastblight. 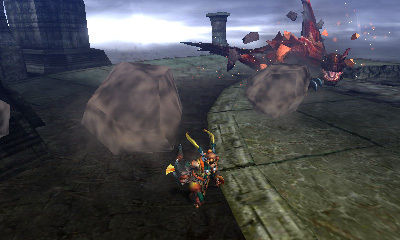 And if you’re too close to the Crimson Tigrex when it uses these attacks or get hit by them, you will be inflicted with blastblight, which will explode for massive damage if the monster lands another hit. So be careful! 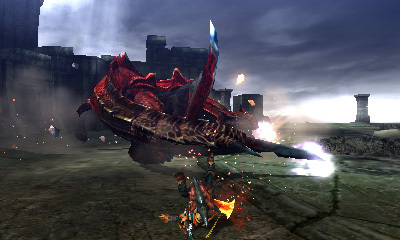 A spinning Crimson Tigrex. The clouds containing sparks will inflict blastblight. 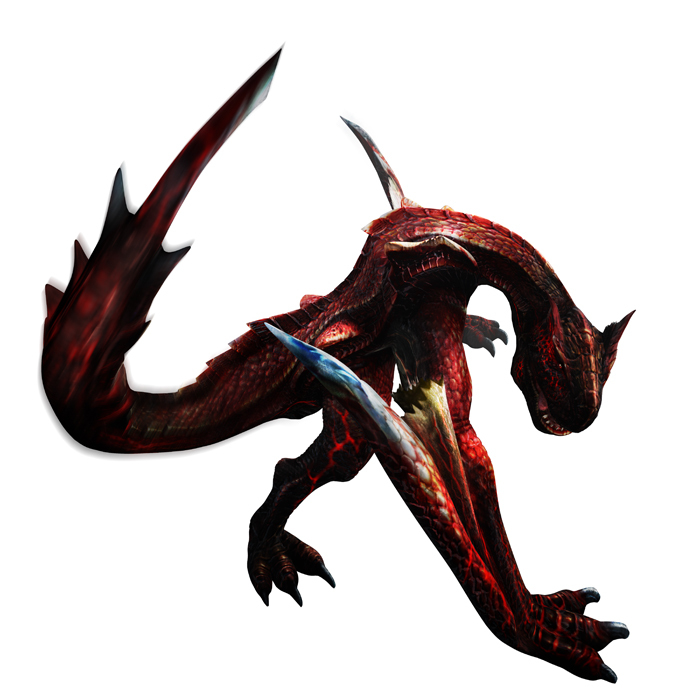 Next week I’ll be looking at the Dalamadur, and then move on to the monsters new to 4G!